The “Migrants and Refugees” Section of the Dicastery for the Service of Integral Human Development published two documents on migrants, refugees, and human trafficking, presented in the Vatican today, January 17. Paolo Ruffini, Prefect of the Dicastery for Communication, and the two Under-Secretaries of the Migrants and Refugees Section of the Dicastery for the Service of Integral Human Development, Father Michael Czerny and Father Fabio Baggio presented the two documents. 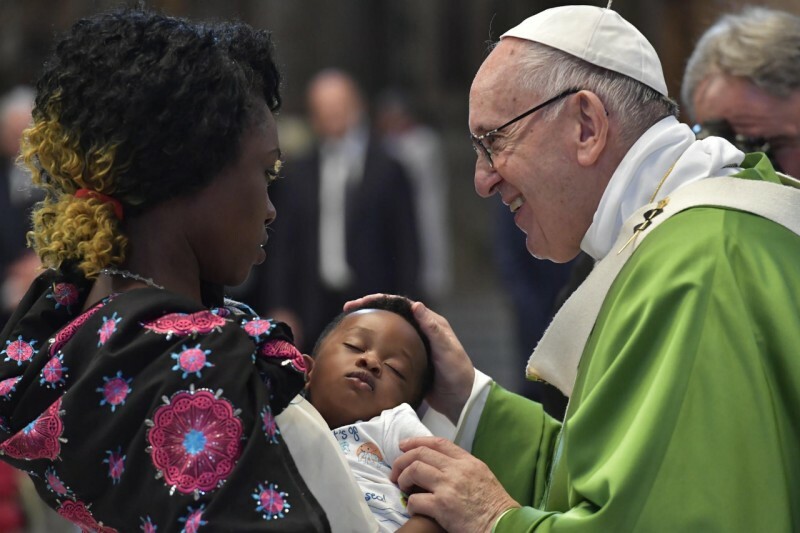 The second document is entitled “Lights on the Ways of Hope — Pope Francis’ Teachings on Migrants, Refugees and Trafficking.” This volume brings together the Pope’s teachings from the beginning of his pontificate to the end of 2017. A digital version is associated to it, with a research program that enables the regular updating of the site on the Pope’s teachings. Zenit spoke to Fr. Czerny and Fr. Biaggio who noted there will be an important conference in April to deepen these themes. Fr. Czerny also commented on how in North America, there are devastating realities of human trafficking that most people would be unaware of. “Think of a young girl. One night she gets in a big fight with her parents. She leaves home, goes to take a bus to a major city. There is someone at the bus port, nice to her,” he said, as an example of how this happens to so many. After that, he noted, they are often on the street and after these experiences, never go back home and return to their lives before. Fr. Biaggio, expressed that the problem also exists because there is demand. He noted that there would not be these perpetrators so intent on their illicit actions, if there were no ‘consumers,’ for what they were doing or offering. Human trafficking is a very complex problem. Its forms are varied and changing, its victims very heterogeneous and so too the perpetrators. Such complexity requires multidisciplinary approaches to understand the phenomenon and its causes, and to identify the processes and persons involved in it – not only victims and perpetrators but also consumers, whether knowing or unwitting. Only then can appropriate responses be shaped. To address trafficking and enslavement, during 2018 the Migrants & Refugees Section consulted partner organizations, researchers and practitioners working in the field. The Church’s full response was considered, in terms of strengths, weaknesses, pastoral action and policy options as well as enhanced coordination worldwide. The resulting draft was submitted to a second consultation with members of Bishops’ Conferences and other Church representatives. Approved by the Holy Father, this handbook reflects current Catholic thinking and courageous ministry. It will orient the work of the Migrants & Refugees Section and our partners. century? How can it remain so hidden? ● and action orientations for the much-needed long-term struggle: What can be done to alleviate and eliminate human trafficking? How can it be done better? challenges of one facet of the phenomenon. It then suggests a range of responses. The Pastoral Orientations are offered to Catholic dioceses, parishes and religious congregations, schools and universities, Catholic and other organizations of civil society and any group willing to respond. They are for planning and evaluating practical pastoral engagement as well as advocacy and dialogue. Key points are also offered for homilies, education and media. The document will help the Church play its important role in this struggle. The Pastoral Orientations on Human Trafficking can be found at https://migrants-refugees.va/trafficking-slavery/ in various languages and formats. 4 Pope Francis, Video Message to the Participants in the International Forum on Modern Slavery, 7 May 2018.